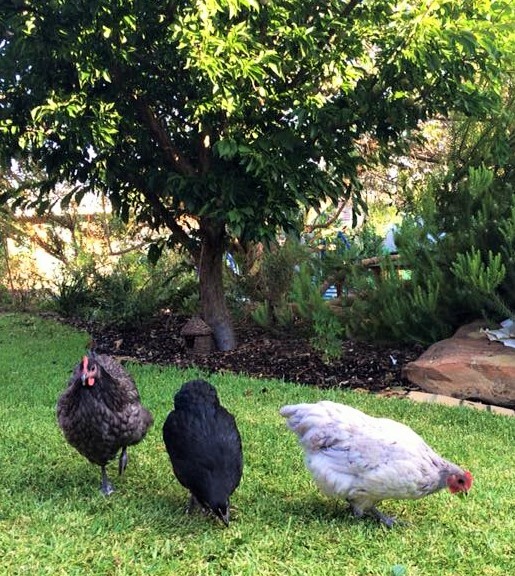 The beautiful personalities of three Australorp chickens settling into the backyard has been a thoroughly enjoyable part of the Christmas break. I can’t describe how much I love them. I wake up and can’t wait to say good morning to them. Chickpea who turned out to be Chuckpea was swapped for a black pullet, at least…I hope she’s a pullet! It can be a little hard to tell, but we’ll just have to see. My youngest chose her name…Fluffy. So, Betty, Penelope and…Fluffy. Then, a gentle chicken-sleeping sound. I found them snoozing up high in the lilly-pilly tree. Such a relief to scoop them up and plop them into their safe night house. Foxes are plentiful around here in wine country. Ah, they are already in my heart, these three. We’ve had the first special gift to them via me. I was excited to find a cockroach in my potting shed, caught it and delivered it with the speed of a pizza delivery guy to the girls. Betty is the boss and so Betty dined on cockroach and we shared a knowing glance of mutual understanding. You know what it’s like when families or friends converge on a house. Who gets which room, who gets which bed. Chickens are no different. In the past we had the luxury of a chicken shed larger than my present garden shed, with multiple height perches and a large flock. Luxury in a tin shed of epic proportions. There was plenty of room to sleep anywhere. However, now with a smaller night house, space is limited and every space has a single purpose. With the arrival of Fluffy, Betty and Penelope had to establish their authority. During the day this was with the odd peck and being punished for daring to share some watermelon. 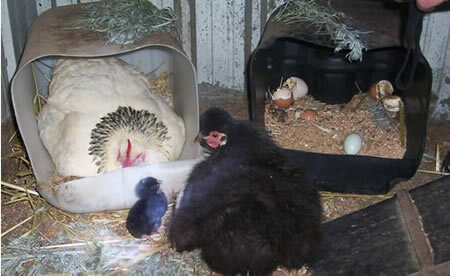 By night, Penelope and Betty both began to sleep in the nesting boxes, banishing Fluffy to sleep alone on the perches. It isn’t a good idea for chickens to routinely sleep in the nesting area because they poo at night, making the area a little unsuitable for egg laying. It can also discourage them from laying as egg laying is usually a bit of a cosy private affair, with a bit of flapping around and shouting it from the rooftops afterwards to announce it. I observed their interactions each day, and noticed in the last few days that the relationships between the three, had steadied and grown. Fluffy had earned her place in the hierarchy and all three were getting along swimmingly, each finding their role. Fluffy was no longer an outcast. This signalled to me, that they would be willing to sleep in the same space together. So, tonight, to discourage Betty and Penelope from sleeping in the nest boxes, I attached cardboard to a piece of squared wire and slotted this in at around 8pm (summer time in Adelaide) as they were trying to settle in for sleep. Then at about 11pm, I checked on them by torchlight to make sure they were all asleep together on the perches and gently and quietly remove the partition. Will this work? I have no idea! Although I let them out of the night house around 5am every morning, they are just before point of lay and who knows when the egg-laying urge will strike, so I don’t want to leave the removal of the partition until morning at this special time in a chicken life – the first egg should be a special and safe experience for a hen. If there’s a lot of poo in the nestboxes and a chicken sized indentation in the straw when I check in the morning, it means they probably moved in there overnight and I’ll have to leave the removal of the partition until morning. I think after a few nights of this, hopefully they will stop going into the nest boxes to sleep. If anyone has any other genius tips for discouraging crashing out in the nest for rest, let me know. It’s fair to say that I’m still learning a lot about the micro-climate of our back garden after five years of growing here. 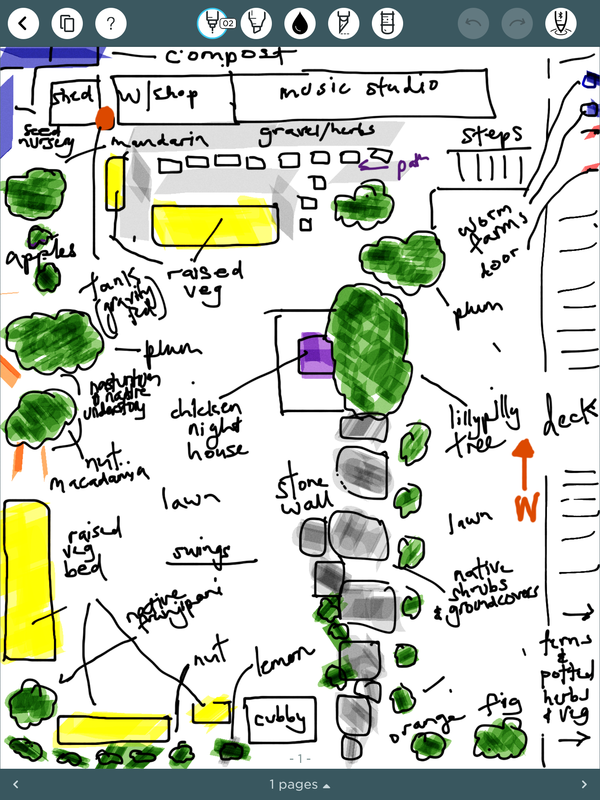 I’m also still learning a lot about permaculture by revisiting and thinking about the principles a lot. With the chickens now a new part of it, I did a quick messy sketch, to review where things are at, and to think about where things are going. The chicken coop is located in shadiest spot of the garden, on the lower level, underneath a large lillypilly tree. This is also a favourite climbing tree for our children. I like the feel of this as the central point of the garden, and there are tomatoes shoved in underneath the plum tree nearby, and anywhere there is a spare space, so the edges are suitable mixed. With temperatures at the moment over 40 degrees for many days in a row, shade is really important for chickens, so having the tree as shelter was obvious, but the location decision was made simple because there was no room anywhere else. With the chickens now involved in the garden, planting around their coop for shade is important (currently using hessian and shadecloth attached to the wire) as the summer sun rises over the hills in the east then bakes both levels of our garden. So my thinking is a comfrey border around the chicken yard, and much more vertical space for climbing fruits and trying out some berries. Also mulching over the invasive lawn on the lower lever and putting in more raised beds at some stage would be great. The south-eastern corner is the wild zone. There are native trees, and some drought tolerant plants including hollyhocks, protea, native violet and grasses that provide sheltered passage from the moss-rock wall where blue-tongue lizards are often seen. You can often hear and see them crunching over dry leaves going to and fro. Between the rocks are tough plants including natives like wooly bush, running postman climber alongside pincushion and king protea to attract birds. The only struggle is the baking hot summer sun on the raised veggie beds, so insulating them a little is in my thoughts too. The two beds that are wicking beds fair better in the south-eastern corner, but the one near the gravel garden struggles. I feel very contented now the chickens are here, no eggs for a little while yet, but their personalties are already making a huge impact. And… the fig tree we planted into a barrel has baby figs!! Here’s a recent photograph of the incredibly debonair Rajiv who grows even more handsome as he ages. He definitely knows it too. Yesterday we purchased four new brown chickens to fill the gaping hole and quietness that losing so many leaves behind. I still can’t believe Rasputin the rooster is gone. The evidence is piling up though. His beautiful green feathers blowing around in the secret garden mean that there is little doubt about the place of his demise. At dusk last night I thought I heard a fox-like animal crashing through the sheoaks. The ducks refused to come off the dam as though they knew something was out there. I couldn’t find anything though and started to doubt myself and suspect fox paranoia. At 1.30am I got up to the dogs barking and checked on the ducks (still safe on the dam) but didn’t see any clever eyes shining back at me in the torchlight. This morning at 8.30am, Elf started growling at the lounge window. I went over and looked along her line of sight which led to the sheoaks and sure enough, there was a rusty smudge in the trees. I ran to get my glasses which translated the rusty smudge into a fox. Seconds later and we were out there with wooden spoons and pan lids chasing it away. It’s an age old tradition – wooden spoons and pan lids to scare foxes. I’m certain for centuries women like me have been grabbing their kitchen utensils and running around their houses in their pajamas chasing foxes. It’s some sort of primeval instinct – it must be, I don’t remember planning my weapon grab. The only problem is that I didn’t adapt the technique for the 21st century and my stainless steel lid broke the wooden spoon. Richard has set a cage (live) trap to see if we can capture the fox. I don’t want to think about what will happen if we catch it. I’ll be in love with it, I know that much. Today we spent a lot of time in the chicken coop making small inroads into making it secure, tidying it up, and generally just making our new chickens feel welcome. We’ve sectioned off some of the yards and I’ve put some of my chicken/cow manure compost brew down and some radish and pak choi seeds to see if I can grow the new girls a little food forest. This is because for the time being they will have to spend a lot of time ‘behind the wire’, except on weekends when we are there to watch over them. 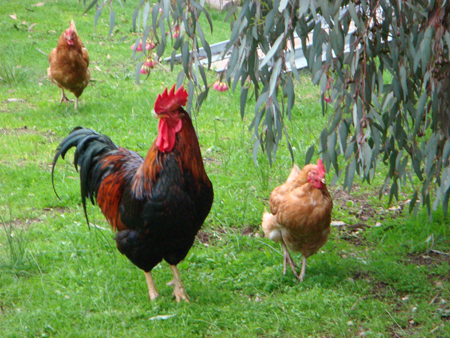 Next week at the auction I’ll be looking out for a new handsome rooster to look after our new ladies. You learn a lot about life from chickens. A few weeks ago a fox pegged off a few of our finest two legged friends. It was very upsetting to have a fox treating a chicken coop like a drive-thru KFC but in my best David Attenborough inner voice I told myself to forgive it – after all instinct is instinct. We take fish from the sea – they take chickens from farms. Life is life. Storm, the cuddliest mother in the flock was lost in this first meal. I think it is ok for a 29 year old to cry about chickens. I’m not sure on the actual benchmark when you get mature enough to ‘just deal with it’. We found a gaping hole in the roof of the chicken coop, next to a tree which looked like the obvious fox entry point. A few weeks passed and we began to trust daylight again and had started to let them free range once more. We’re still not sure exactly when this latest massive attack happened, but it was seemingly overnight, so the fox may have just opened itself another door somewhere. On Thursday morning five more had gone seemingly overnight. Only one young chick (now named Lucky) and our two ducks remain. Rasputin, the jovial lady-loving lad is gone too. He was special, a handsome immense rooster – I’m sure he put up some sort of fight for his ladies. Our two ducks were also spared. I can’t imagine never seeing cheeky Rasputin again…he had a presence. I respect the cunning creativity and wily ways of foxes….I don’t want this fox dead….I just want it to stop eating my chickens. I hate fox hunting and if the truth is known, I love foxes – even this one. If I came face to face with it I could no more kill it than hug it. The thought of it dying in agony by using fox bait just because it dared to eat my chickens seems like nothing but a warped way of handing out some sort of punishment or justice. It’s not like this fox is laughing behind my back and licking its chops like in the fairy tales….this animal is probably scraping out a living in an increasingly urban environment, adapting and struggling just to get enough to eat each day and may have even taken our chickens back to it’s den for some young cubs. Watch any documentary about predators and you truly can’t help understanding them. The status of foxes as a pest species is a human made problem and now the fox is marginilised as a pesky chicken killer because of it. I can’t be angry at it and I don’t want revenge. Forgiveness is my tragic flaw. Maybe I could try reasoning with it…I think what we are going to try is to rebuild the flock but also acquire 2 geese as protectors – but some people say this doesn’t work. 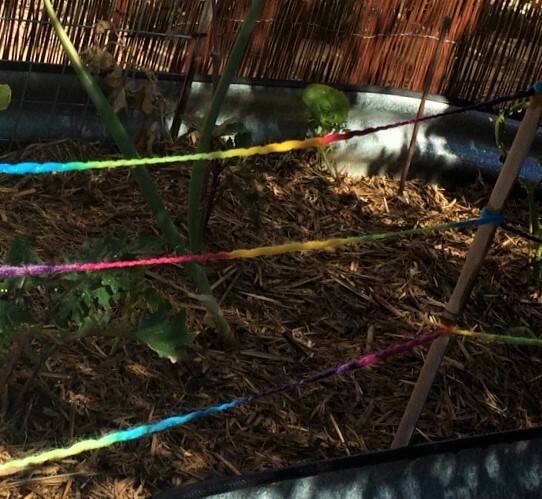 I don’t want to restrict my chickens to life behind chicken wire…but for their own safety we will need to for a while. 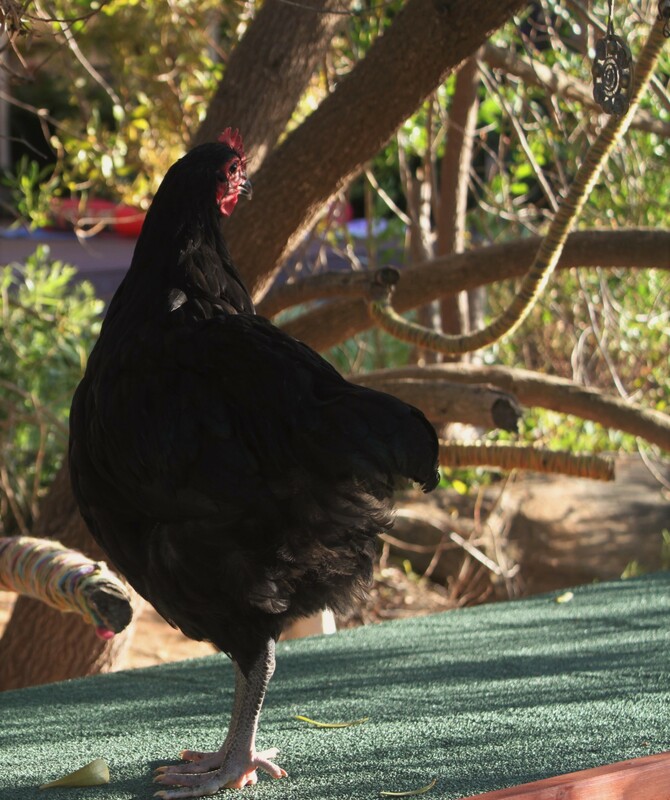 Our old black chicken Kali has gone to the big forest in the sky (historically chickens were forest dwellers so it’s only natural that their Avalon is a forest). She was ancient, and a fierce protective warrior when our cats first introduced themselves hence being named after the Indian warrior goddess. It’s weird because with so many animals, a death sort of passes without thought almost, but ocassionally I get a spare minute to reflect and remember my lost little chicken companion. Our very first chicks! I was so excited I ran across the yard to get Richard from the house. My heart is full of chicken love. I’ve been looking after the broody mums so I guess this makes me a chicken grandmother at 28. Muppet & Gaia’s eggs hatched this afternoon. I managed to get a photograph of one but I don’t want to disturb the new mums too much. We have *no* idea if you are supposed to site two mums and chicks together in the same secure space but they’ve been here happily since they went broody. I can’t find anything in the books that warns against it, so we’ll just have to keep a close eye on them to make sure they all seem to get on. I think Muppet (the black silkie) has 3 successes and Gaia has at least one. One chick did not emerge fully from the shell and perished, but you can’t really intervene to stop this. It’s probably a little strange to get so excited about hatching chickens but there is still a sense of awe in watching a broody hen sit on her eggs for a committed 21 days and seeing little fluffy chicks emerging. I think I’m more excited about it than the chickens. I just can’t see the attraction of incubators though, the best part of it is seeing the mother chick eye to eye with her little creation. Now for the potentially sad bit…survival of the fittest.